Manchester City host Arsenal as they look to emulate the Gunners' invincible season and go unbeaten. 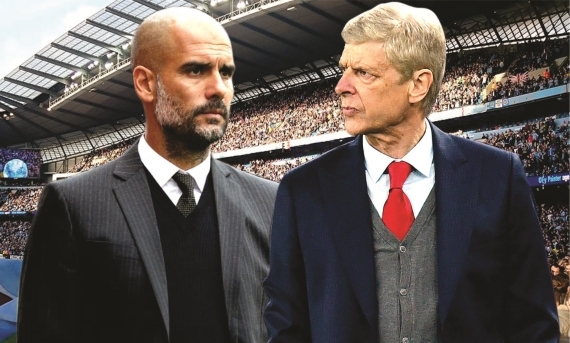 Manchester City welcome Arsenal to the Etihad Stadium on Sunday in what promises to be a cracking encounter. These sides last met in April in the FA Cup semi-finals when Alexis Sanchez scored a dramatic extra-time winner as the Gunners came from behind to beat Manchester City 2-1 at Wembley. Their last league encounter was at the Emirates with Arsene Wenger’s side coming from behind twice to earn a 2-2 draw, but last season’s meeting at the Etihad saw Pep Guardiola's side claim maximum points with a come-from-behind 2-1 victory. Manchester City are five points clear at the top of the Premier League, following their 3-2 win over West Brom at the Hawthorns last Saturday. The Citizens remain the only unbeaten side in the league with 28 points from 10 fixtures. There’s even been talk about Guardiola's side matching the feat of Wenger’s Invincibles and going the whole season unbeaten. City have been in rampant form this season, scoring 43 goals in just 14 games (at the time of writing) and have scored five-plus goals in four league games already. Kevin De Bruyne and David Silva are joint leaders on the assists list with six a piece, while Leroy Sane has five to his name. Sergio Aguero and Raheem Sterling are the club’s joint top-scorers with seven goals, while Gabriel Jesus and Sane have netted six times. City have threatening options all over the pitch and it’s going to be very difficult for Wenger’s side to cope with them. City are unbeaten at home since their 3-1 defeat against Chelsea in December last year. Since then, they’ve played 26 matches at the Etihad and won 19 times. In the Premier League this season, Guardiola's side have won four of their five home games, scoring 21 goals while conceding three times. Manchester City are targeting a ninth straight Premier League victory on Sunday. If they achieve that against Arsenal, Guardiola's side will be hopeful of matching Chelsea's 13-game winning streak last season. If they manage to do that, they’ll have the possibility of equalling Arsenal's 14 consecutive top-flight wins in the Manchester Derby at Old Trafford on 10 December. Arsenal followed up their impressive win at Everton, with a 2-1 victory at home to Swansea. Wenger’s side will be looking to make it three wins in a row for the first time this season, but they’ll need to be at their best against City to get a point, let alone three. When Arsenal travelled to the Etihad last season, they were leading at half-time thanks to Theo Walcott's early goal after a dominant first half performance, but Wenger’s side collapsed after the interval as City came from behind and swept to victory. But prior to that defeat, the Gunners managed to pick up four points in their previous two trips to the Etihad. In the 2015/16 campaign, Wenger’s side fought back twice to earn a 2-2 draw and the year before that they claimed a memorable 2-0 victory, inspired by Santi Cazorla. Arsenal’s main concern going into this game is their current away form. Their first victory on the road came at their fifth attempt in a 5-2 win over 10-man Everton, which led to the sacking of Ronald Koeman. Prior to that game, Wenger’s side had suffered defeats away at Stoke, 1-0, and Liverpool – a 4-0 massacre – and their credible draw at Chelsea was forgotten when they lost 2-1 at Watford. The Gunners will know that they have to raise their game against City or they could take a battering. It’s going to be extremely difficult for any team to beat City this season, especially at their fortress, but Arsenal have enough quality in their side – Alexis Sanchez, Mesut Ozil, Alexandre Lacazette – to cause the Citizens some headaches. Cech; Koscielny, Mertseacker, Monreal; Bellerin, Ramsey, Xhaka, Kolasinac; Ozil, Alexis; Lacazette. Manchester City have been in top form this season and they’ve won their last four matches at the Etihad, scoring 20 goals while conceding twice. Arsenal have struggled away from home with three losses from five games, winning just once. Back Guardiola's side to claim maximum points.